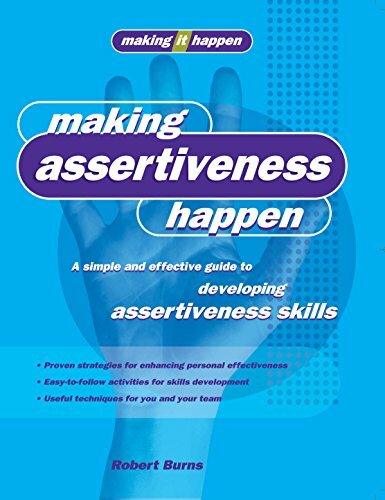 Making Assertiveness Happen: A Simple and Effective Guide to Developing Assertiveness Skills (Making It Happen series) by Burns, Robert: Allen & Unwin 9781865089904 PAPERBACK - BookResQ. Assertiveness is a positive communication skill that can foster effective working relationships, reduce stress levels, and maximize performance. Demonstrating how assertiveness can enhance both individual performance and the well-being of the entire work group, this skill-building practical guide encourages positive change for greater workplace effectiveness and satisfaction. When individuals learn to stand their ground while respecting the interests of their fellow team members and the larger organization, a work group can function effectively and harmoniously. Included is vital advice on what works and what doesn't, what tricks to use, and what traps to avoid. Robert Burns is the author of Psychology for the Effective Manager.